On July 14, 2015, the P5+1 (China, France, Germany, Russia, the United Kingdom, and the United States), the European Union, and Iran reached a Joint Comprehensive Plan of Action (JCPOA), better known as the Iran Nuclear Deal. 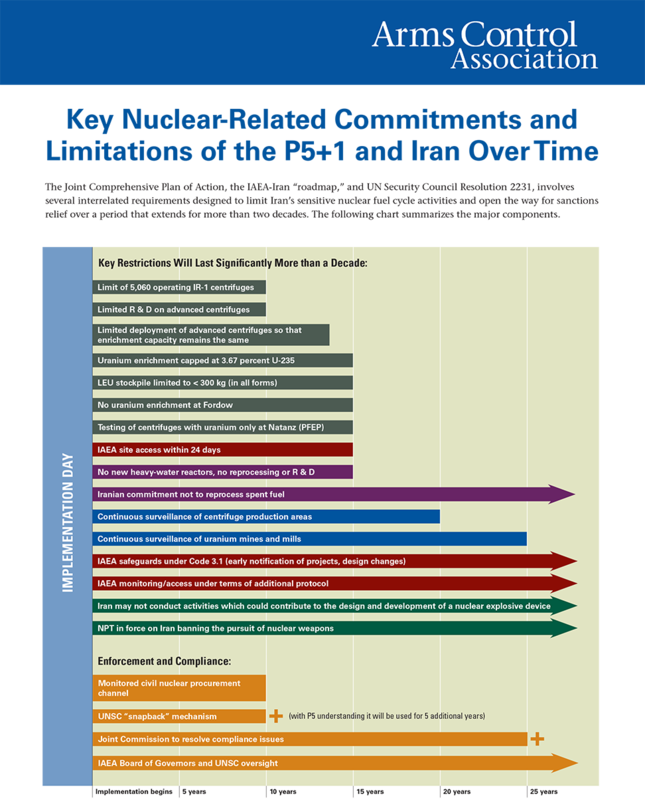 In exchange for sanctions relief, the JCPOA forced Iran to accept restrictions on its illegal nuclear program and a new corresponding inspections regime. Taken together, the terms of the deal have increased Iran’s breakout time using uranium – the amount of time it would take to create enough uranium to build a bomb – from two or three months to twelve months or more. It eliminates Iran’s ability to produce weapons-usable plutonium for at least 15 years. And, it ensures scrutiny to block Iran from engaging in any such activities covertly. Failure to comply with any of the deal's requirements would lead to punitive steps, including but not necessarily limited to the resumption of sanctions. The deal has received strong support from key European allies and more than eighty of the world's leading nuclear nonproliferation experts. Senior members of the president’s own national security team have testified in favor of continued American participation in the deal. In May 2015, Congress asserted its own authority over the agreement with the Iran Nuclear Agreement Review Act, requiring the president to certify certain aspects of the deal to Congress every 90 days. In July 2015, it was made into international law by U.N. Security Council Resolution 2231 in an unanimous vote. On May 8th, 2018, President Trump announced his decision to violate the agreement, turning his back on its other signatories by vowing to reinstate nuclear-related sanctions on Iran despite Iranian compliance with the terms of the agreement. Since withdrawing from the deal, America has become isolated from its global allies, who have scrambled to try to save the deal and prevent a new war of choice in the Middle East. Immediately following Trump’s announcement, the European Union’s High Representative for Foreign Affairs, Frederica Mogherini, said she is “worried by the announcement of new sanctions… the European Union is determined to act in accordance with its security interests and to protect its economic investments.” In other words, our European allies promised to go it alone to support this critical non-proliferation agreement. Soon after, the E.U. began leading efforts to create a non-dollar denominated financial alternative in order to continue trade with Iran and save the deal. On November 4th, 2018, the Trump administration reinstated all nuclear-related sanctions on Iran that were once lifted by the deal despite protests from our closest allies. This strategy bears little resemblance to the sanctions levied by the Obama administration. Unlike President Obama, President Trump failed to rally international support to re-sanction Iran. As of February, China and India, the two most populated countries in the world, continue importing Iranian oil. In January 2019, as international pressure against the administration continued to mount, President Trump faced further domestic pushback on his Iran strategy. Testifying before the Senate Intelligence Committee on the release of an annual threat report, American intelligence chiefs asserted that Iran remained in compliance with the JCPOA. Days later, international opposition to the Trump administration’s Iran strategy formalized when three European allies –– Britain, France, and Germany –– created a special purpose vehicle (SPV) to circumvent the U.S. dollar and continue certain trade with Iran. The new company, Instrument in Support of Trade Exchanges (or INSTEX, for short), is designed to enable the legitimate trade of non-sanctionable humanitarian goods and is the first time Europe has created a framework that bypasses U.S. financial markets that could undermine the utility of future American sanctions. With the Trump administration inching us closer and closer to war with Iran, we need Congress to step up and prevent the White House from taking unilateral military action. Senator Tom Udall (D-NM) has introduced Senate Bill 3517 to prevent an unconstitutional war against Iran. Call your senators at (202) 224-3121 and ask them to support this important legislation. We don't need another war in the Middle East, and it's unfair to our brave men and women in uniform to ask them to fight because of reckless, erratic decisions by President Trump and John Bolton. Congress alone has the constitutional power to authorize war. It must act as a check on the executive branch and prevent President Trump from taking the country down this dangerous path.